Partly cloudy. High near 60F. Winds N at 15 to 25 mph. Higher wind gusts possible..
Clear skies. Low 37F. Winds NNW at 10 to 15 mph. Colorado Gov. 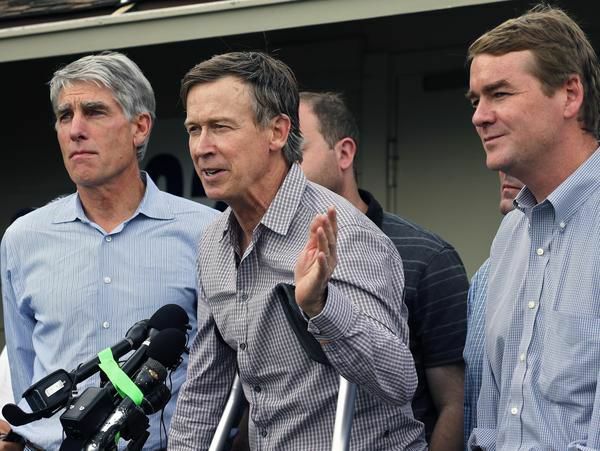 John Hickenlooper, center, and U.S. Sen. Michael Bennet, right, along with then-Sen. Mark Udall, left, speak to reporters after touring flood-damaged areas by helicopter in September 2013. They’re business-friendly Democrats whose Colorado brands are built around bemoaning partisan bickering, but their styles couldn’t be more different. Where Gov. John Hickenlooper’s middle name might as well be “quirky,” U.S. Sen. Michael Bennet is anything but. Hickenlooper, 66, a one-time geologist who helped spark Colorado’s brewpub revolution, speaks in a rushed jumble, like a bartender bantering with a customer. Their political careers have run in tandem from the start. Hickenlooper hired Bennet, a fellow alumnus of Wesleyan University in Connecticut, to be his chief of staff after the beer pioneer was elected mayor of Denver in 2003. They both won election in 2010 to the top statewide offices they still hold, defeating tea party Republicans during a GOP wave year, though Bennet had been appointed to the Senate to fill a vacancy a year earlier. Hickenlooper won a second term in 2014, and Bennet won his second full term in 2016. They’ve also both landed on national-ticket short lists compiled by top Democrats. Hickenlooper was a finalist to be Hillary Clinton’s running mate in 2016 (the nod went to Virginia U.S. Sen. Tim Kaine). And shortly after the 2016 election, then-President Barack Obama included Bennet among “gifted Democratic politicians,” along with Kaine, U.S. Sen. Kamala Harris of California, and Pete Buttigieg, mayor of South Bend, Ind. And as 2020 presidential election campaigns kick into gear, Hickenlooper and Bennet both are languishing back in the pack in the single digits among a sprawling field of potential Democratic candidates in the few public polls that have included them. Neither Hickenlooper nor Bennet is an official presidential candidate yet, despite the couple of times Hickenlooper has “misspoken” and said he’s running. Using the same metric — and taking him at his word — Bennet is further from launching a campaign. He’s testing the waters, along with another dozen or more Democrats who would kick themselves years from now if they hadn’t dipped their toes in the party’s most wide-open presidential pool in memory. Still, the two were basically tied in the first national poll that included them for the 2020 Democratic presidential nomination. In a Dec. 9-11 national Fox News poll of registered voters, 9 percent of respondents said Hickenlooper would make an excellent or good president, and 9 percent said Bennet would be an excellent or good president. Bennet was slightly better known than Hickenlooper, with 46 percent of respondents saying they’d never heard of him, compared with 48 percent who said they’d never heard of the governor. As in other polls, former Vice President Joe Biden and U.S. Sen. Bernie Sanders of Vermont topped the list of Democrats — 16 on this survey — with 47 percent of respondents saying they thought Biden would make an excellent or good president and 40 percent saying the same for Sanders. A CNN/Des Moines Register Iowa caucus poll, conducted Dec. 10-13, didn’t include Bennet among Democratic prospects but found Hickenlooper with numbers similar to those in the Fox News poll. Among likely Democratic caucus-goers in Iowa, 24 percent said they have favorable feelings toward Hickenlooper; 9 percent said they don’t like him; and 67 percent said they didn’t have an opinion. Hickenlooper ranks behind 14 other Democrats in favorability ratings, including Biden and Sanders, who led the field, with 82 percent and 74 percent, respectively. But Hickenlooper ranks ahead of seven others who were even less well known. The Des Moines Register poll was met with a hail of criticism that pointed out it’s more than a year until the Iowa caucuses, and the field isn’t close to complete. But media organizations and academic institutions have been asking the public about presidential prospects well ahead of the next election for decades. Take the results with the usual shaker of salt. None of the polls taken at the same point in the 2016 presidential election cycle, for instance, even included Donald Trump as an option. It would be six more months before he rode the Trump Tower escalator into what quickly became his unchallenged front-runner status.